This sales agent register is dedicated to giving you the latest opportunities from principals targeting the UK markets for a wide range of products and services. Get the latest opportunities for self employed sales agents emailed directly to you. All the opportunities are for agents selling into the UK marketplace. Add to your current product portfolio or look for a complete new line to sell. Contact the principals directly with your application. And there is no charge to sales agents for all these benefits. By adding your name to the agent register you will get weekly updates on opportunities from business principals emailed directly to you. The register is managed by the website Salesagents.co.uk and you can read more about them below. Over the coming months there will be many changes to both the website and the register. So this is an exciting time to start using the benefits they can offer. The register will be refined so that the sales agent jobs, opportunities, sent to you will become more targeted to your requirements. By adding your name to the register you will be joining other self employed sales agents that want to connect with business principals from both the UK and abroad who are targeting the UK marketplace with their products and services. Salesagents.co.uk only focuses on connecting sales agents with principals targeting the UK market. The website can be updated daily with new opportunities as principals become aware of the effectiveness of advertising to the large number of self employed agents that visit the site and are on the sales agent register to receive regular updates. The website is fast becoming a source of information for both sellers and principals. Relationships are being built with service providers for sales agents so we can now connect agents with legal professionals with experience of agency contracts if needed. 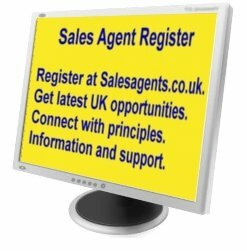 Salesagents.co.uk is growing into the leading online platform for connecting agents with new opportunities and offering information and supporting services. The principals that advertise with Salesagents.co.uk offer a range of opportunities for agents to sell their products and services. There are opportunities for sales of products with a range of values and average order numbers. There are some with repeat business and others that are one off sales. The customers can be retail, B2C direct sales to end users, sales to distributors, a full range of retail outlets, building trade and contractors, and just about every industry and marketplace including technical and specialist sales. Some principals are looking for agents dedicated to just their products, others want agents with an existing portfolio of products and an existing customer base. The one thing all the opportunities have in common is that they are all for sales agents in the UK. You can enter a much detail as you want, including a CV. Your application has to be approved to maintain the quality of the register. You will be sent weekly updates on the new opportunities available. Self employed people who sell their own services. And they have been used by managers to train their teams. A professional training course that will give you increased sales and job security.